This week’s recipe for the Tuesdays with Dorie bakers is Fold-Over Pear Torte, selected by none other than Cakelaw! Her blog, Laws of the Kitchen, is on my regular reading list. She’s a blogger from Down Under who makes delicious treats for her coworkers and delectable dinners for friends. The torte she selected for us is sort of like a deep-dish pie filled with pears, apricots, and custard flavored with vanilla, almond, and rum. I made half the recipe and baked it in two 4.5″ springform pans. I used diced dried apricots (rather than the other option, raisins). I used whole milk instead of heavy cream. How it went: This was my first time making Dorie’s Good for Almost Everything Pie Dough and I think it went pretty well. I manhandled it as I put it in the springform pans, and it held up pretty well. I used a hand mixer to make the filling, since I had a small amount, and it came together quickly. How it tasted: I must admit that this is a recipe I wouldn’t have selected on my own. A fruit and custard pie doesn’t sound that appealing to me. However…it was really good! The filling wasn’t eggy and custardy like I would have expected; it was a creamy filling with delicious flavors. I also loved the combination of pears and dried apricots. I’m a crust lover, and there was a lot of crust. My husband liked this also, especially the crust. Pears are not his favorite fruit, but he still enjoyed this. Two thumbs up from our house! Want the recipe? You can find it on page 348 of Baking: From My Home to Yours, or you can find it on Laws of the Kitchen today. Ciao Jill ! Your torte looks very nice ! A deep dish pie is a good description of this – it kind of defied description for me. I would leave out the nuts next time too – it was not quite right with the custard for me. This is only the second time I have made this pie dough – the first time was a disaster (the twofer pie) and it has been nearly two years since I tried it again! Your torte is very handsome – thanks for baking along with me this week. Your torte looks delicious! We loved this one even with the pears, but wanted more custard. Your torte looks great! I’d probably to with the apricot alternative, too, because I have a couple of non-raisin fans in my house. I’m glad your pastry work out — I always worry about my pastry until it’s done. Well it gets a big thumbs up from me too..It’s beautiful! So cute…love that size. Good call on the nuts, I am leaving those out next time for sure…it was strange having nuts in custard. Other than that, I was surprised we liked it so well. I like the small version…this takes a whole lot of people to eat it at full size! We made the same size tortes this week Jill! I love your mini – so cute! This was my first experience with Dorie’s pie crust too and I think it’s definitely a keeper. I like it that you made into smaller serving sizes. Your torte looks very chic! 4.5″ pan? Gotta find me couple of those. I love how your break down your posts. Your torte turned out beautifully. Your torte looks fantastic! I wish I’d remembered the powdered sugar. I was wary of the custard as well, but it was so nice and light. Your torte looks great with the pwd. sugar on top. Mine was kind of a flop, but it’s always fun to try out all these different recipes. Minis are a great idea. Good thing I had plenty of people to share this one because a full sized one is HUGE!!!! with so much fruit. Sorry for the delayed response!!!! yOUR TORTE LOOKS REALLY GOOD! I love the mini version! 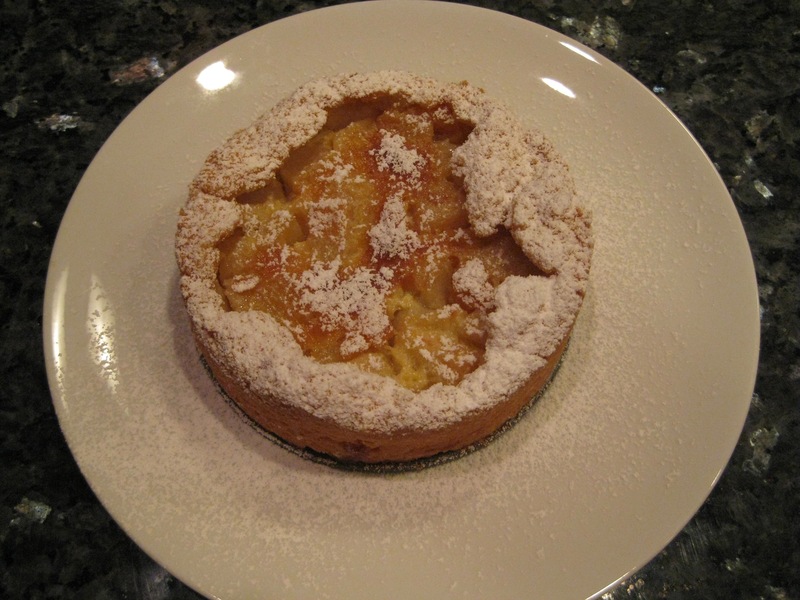 I think a pear tart sounds delicious and I’m glad that the recipe worked for you! What a beautiful tart! One of the best things about TWD is discovering things we wouldn’t have made otherwise. So glad you tried (and liked) this pear torte! If you ever need additional ins-pear-ation, check us out at http://www.usapears.org. Thanks for sharing the pear love!